I was born in Lisbon, 1987. I belong to a generation that is extremely consumerist, materialist and greedy. With the production of things at its highest, the production of „waste“ and unused objects is also at its highest. „Waste“ is quoted because of its abstract definition: „one man’s trash is another man’s treasure“. I create, recreate, assemble and develop ideas with end-of-life material and try to relate it to sustainability, ecological and social awareness. Trash Animals is a series of artworks that aims to draw attention to a current problem that is likely to be forgotten, become trivial or a necessary evil. The problem involves waste production, materials that are not reused, pollution and its effect on the planet. 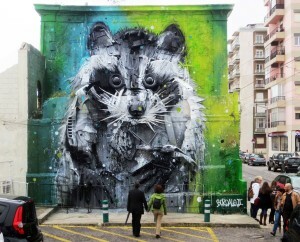 The idea is to depict nature itself, in this case animals, out of materials that are responsible for its destruction. These works are built with end-of-life materials: the majority found in wastelands, abandoned factories or randomly and some are obtained from companies that are going through a recycling process. Damaged bumpers, burnt garbage cans, tires and appliances are just some of the objects that can be identified when you go into detail. They are camouflaging the result of our habits with little ecological and social awareness.